Honinbo League: The third game in the new Honinbo League was played on October 18. Taking black, Ichiriki Ryo 8P beat Ko Iso 8P by resignation. The opening round was completed on October 25 when Shibano Toramaru 7P (B) beat Kono Rin 9P by 2.5 points. The league chart was given in my previous report (October 21). Korea wins International Gratitude Cup: The Gratitude Cup is an unofficial tournament for junior players in Japan that was founded nine years ago. Five years ago, it added an international component, pitting five-player teams (including two women players) from China, Korea, Chinese Taipei, and Japan against each other. First, a three-round tournament is held; the top two teams go to the final and the bottom two to a play-off for third place. The 5thGratitude Cup International Young Stars Tournament, to give it its full name, was held in Ise City on October 14 and 15. In the first section, China scored three wins, beating Chinese Taipei 4-1, Korea 3-2, and Japan 4-1. Korea won two matches, beating Japan 4-1 and Chinese Taipei 5-0. Japan beat Chinese Taipei 3-2. In the final, Korea turned the tables, beating China 4-1; Japan beat Chinese Taipei 3-2 to take third place. For Japan, Ichiriki had the best results, scoring 3-1. First prize is 4,500,000 yen (about $41,000). 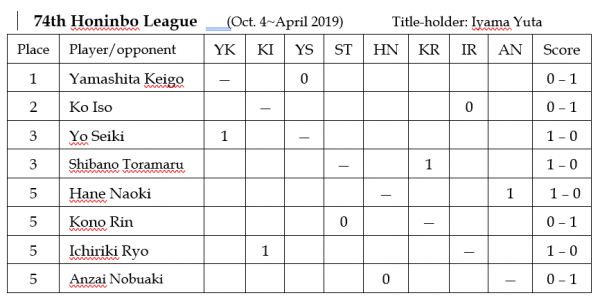 Kono reaches Kisei play-off: The third game in the irregular knock-out to decide the challenger for the 43rd Kisei title was held at the Nihon Ki-in on October 22. There was probably a lot of fan support for the 18-year-old winner of the C League, Onishi Ryuhei 3P, who had beaten the winners of the B and A Leagues. 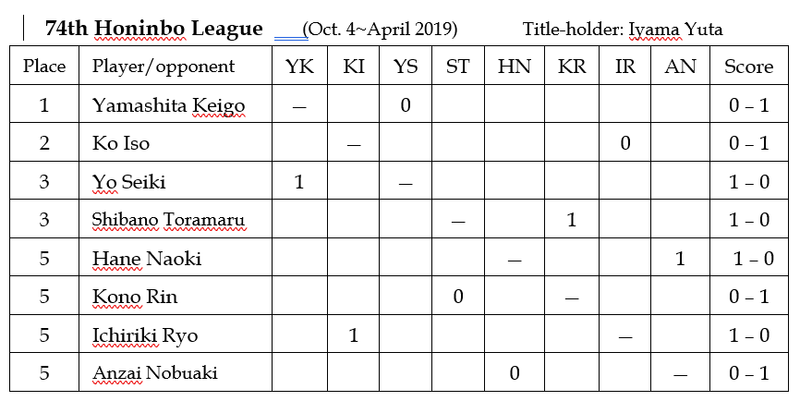 Three more wins and Onishi would be the challenger, but Kono Rin 9P, who came second in the S League, stood in his way. The game was very close, but Kono (W) was too wily for his opponent, eking out a win by half a point. Ichiriki makes good start in Oza: The first game of the 66th Oza title match was held at the Hotel Gajoen Tokyo in Meguro, Tokyo, on October 26. Taking white, Ichiriki Ryo 8P beat Iyama Yuta Oza by 2.5 points after 285 moves. That’s a very encouraging start to his challenge for Ichiriki after the ordeal he underwent last winter. In effect, Ichiriki played a best-of-17 with Iyama when he made successive challenges for the 2017 Oza and Tengen and the 2018 Kisei titles; he was unable to pick up even one win, which means he lost ten title-match games in a row. However, there is a caveat concerning this win. Iyama actually played brilliantly from the opening on, first making a successful moyo invasion, then, in what was more or less a continuation of the same fight, winning a big ko fight in the center. At this point, he was convinced he had a win. His first misstep came when he missed the best defensive move for securing the capture of some stones related to the center ko fight. Ichiriki was able to take some profit by harassing his position. He then turned his left-side position into a moyo and, according to spectators, seemed to have visibly perked up. When Iyama missed an endgame move that would have kept him narrowly ahead, Ichiriki was able to pull off an upset. The second and third games will be played on November 17 and 19.